Police launch inquiry after ‘base jumping’ by up to three men. 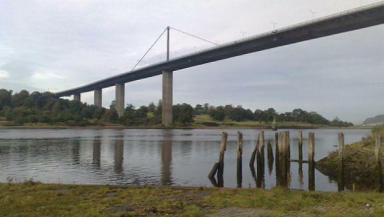 Adrenaline junkies jumped off Erskine Bridge and parachuted to the ground at the weekend. Strathclyde Police have launched an inquiry after three men are thought to have taken part in the activity known as ‘base jumping’ at around 10pm on Saturday. Officers were called to the bridge after reports of two or three men leaping from the bridge and landing on ground nearby. A Navy Sea King helicopter from HMS Gannet, coastguard teams and officers from Strathclyde Fire and Rescue were all called out to the bridge following the incident. A spokeswoman from Clyde Coatguard, who was involved in the search, told STV News it is believed the jumpers scrambled into a waiting car after completing their stunt. A spokesman from Strathclyde Police added: "It is believed two or three men were base jumping. Enquiries are ongoing."